Efficiency, light weight, small size. These are the keywords of innovation today. 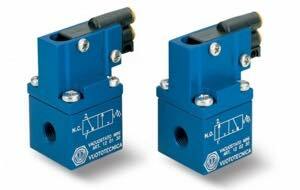 Vuototecnica always answers to market signals in a prompt and responsive way, and to meet the needs of customers designed a vacuum switch which has very small size: the pneumatic mini vacuum switch. This device is able to generate or eliminate, depending on the model, a pneumatic signal at the attainment of a certain vacuum degree, previously set by the customer. It is ideal for the control of Vuototecnica multi-stage vacuum generators PVP 25/75 MDX that, in their shape, have a special site for the installation of this mini vacuum switch. Once mounted, combined with a pneumatic slide valve and a special check valve, it allows users a considerable supply compressed air energy saving and increases the capacity of the generator. The pressure differential existing between the maximum set value and the reset value of the signal at rest is about 100mbar. The vacuum conservation of foods has revolutionised the way we conserve food, enabling us to keep fresh products unaltered for longer periods of time. However, in order to be able to offer consumers quality products, it is essential to check the vacuum levels of the packaging. Bearing in mind the requirements of food companies, Vuototecnica has designed a vacuum gauge with steel punch able to immediately identify the vacuum level within tin cans and other food containers. 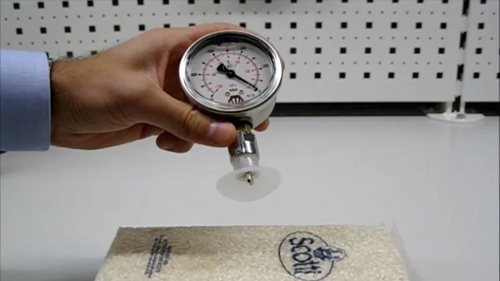 The glycerine bath 09 05 99 vacuum gauge is equipped with a tempered steel punch which enables easy piercing of the containers, and a suction cap able to maintain the vacuum subsequent to piercing the package undergoing testing. The result reading panel is an enclosed, strong metal box with glass in front and features a dual measurement scale. The measurement device is based upon the Bourdon spring technology, providing maximum accuracy. All Vuototecnica vacuum gauges are manufactured in compliance with all safety standards and as per EC regulated units of measurements. Work cycle start ups, proper energy management and safety requirements all require the use of precise tools that will facilitate the measurement and the verification of the vacuum levels being generated by the vacuum sources, such as rotating vane vacuum pumps or pneumatic ejectors. To this end, Vuototecnica offers a wide range of vacuum switches, including extremely compact and lightweight digital models. Thanks to these specific characteristics, these units can be mounted in close proximity to the vacuum applications themselves, representing immediate and intuitive tools for the end user. The flagship of this range of components is the digital vacuum switch 12 10 10. 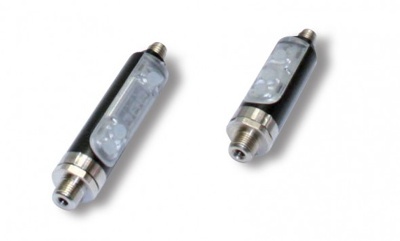 Its compact cylindrical configuration, complete with a digital display, allows for the vacuum values ​​to be immediately viewed, thus rendering the use of a vacuum gauge superfluous; it can even be easily turned on its own axis with no need to unscrew it from the vacuum connections. The control panel allows for the easy programming of the device’s parameters, including the switching points and hysteresis from 0 to 100% of the set value, and even offers a range of additional features, like comparisons between values, NO and NC contacts, units of measure and the blocking of functions and programmed values. The panel includes two LED indicators (one green and one red), which indicate the switching status of the two digital output signals. The two switching outputs are independent. The unit comes installed as a standard feature on board the GVMM range multi-stage and multifunction vacuum generators, not only to verify the generation of the vacuum level required for the application, but also to manage the pneumatic ejector’s compressed air supply, thanks to the hysteresis function and a electrical cable specifically designed for managing energy savings. The Vuototecnica product range also includes the 12 05 10 P digital micro vacuum switch, which is even more compact and features a switching time of less than 1 millisecond. In hospitals, construction sites, industries, laboratories and any place where a constant and adjustable vacuum level must be maintained a vacuum regulator is the ideal solution. Specific reducers exist depending on the required use, for low or high vacuum levels. The vacuum reducer is a valuable tool as, for example, when installed in centralized systems in which each conductor can be adjusted to a value different from the vacuum level of the central plant. Vuototecnica is the pioneer in Italy in manufacturing state-of-the-art vacuum reducers. For more than 30 years, the reducers have been the flagship product in the Vuototecnica catalogue and there are various types of them. • Vacuum reducers with pneumatic adjustment, that exploit pneumatic principles in defining the ratio between the compressed air supply and the vacuum level to be obtained. The reducers can be installed even in places far from the central control unit and they are operated via a pressure regulator on the control panel. The vacuum is maintained constant by Vuototecnica reducers even when there are fluctuations in the pump or vacuum pumpset, the atmospheric air never enters the circuits, thereby preventing products from being warped by too much low pressure. One end of the spring, in a special copper alloy, is welded to the threaded pin of the vacuum gauge – pressure gauge, forming a single body, while the other end, closed, is left free so that it moves, and therefore measures the vacuum level, based on the pressure or depression which passes through the spring’s body, deforming it. Vacuum measurement is substantially based on the principle of operation of a spring, discovered in the 1800′s by French engineer and watchmaker Eugène Bourdon. From this basic principle entire ranges of more and more innovative vacuum metres have been developed, enclosed in strong metal cases even with dual scale faces and indexes, available on the market in the most varied versions: vacuum metres with radial or coaxial connections, with flush flanges or for external use, dry or in glycerine baths. The selection of vacuum measurement, control and regulation instruments is truly vast, both analogue and digital, useful to provide a very precise digital signal at the maximum set measurement value. To find the vacuum gauge which is most suited for your activities, see the Vuototecnica team of experts, who can recommend the most customised solution for you from among the wide range of Vuototecnica vacuum and pressure gauges. 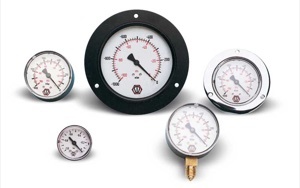 At Vuototecnica you can find all of the pressure and vacuum gauges useful for your operational needs, all built in absolute observance of safety standards and with the currently used units of measurement in the European Community.